If you are the kind of player who spends 90% of their time on the driving range practicing how to hit their driver, you may want to think about changing your priorities. On a typical golf course, there are only 14 chances to hit your driver with all of the remaining shots spent on irons and putts. Your iron play is the backbone of your game that gets you down the fairway and onto the green. If you want to improve your game and become a better golfer, hitting straight iron shots keeps your ball in play and trains fundamental swing habits that help you improve your driving as well. Improve your game with these three tips on how to hit irons straight. Before each shot pick out your target. It is shocking how often golfers step up to their ball without thinking about where they want their ball to go. The simple truth is that knowing your target dramatically increases your likelihood of hitting it. When selecting a target, make it as small as possible, while still being able to sight it easily. Thin tree trunks, telephone poles, or distant chimneys all provide great targets that require your brain to be precise in aiming and executing each shot. 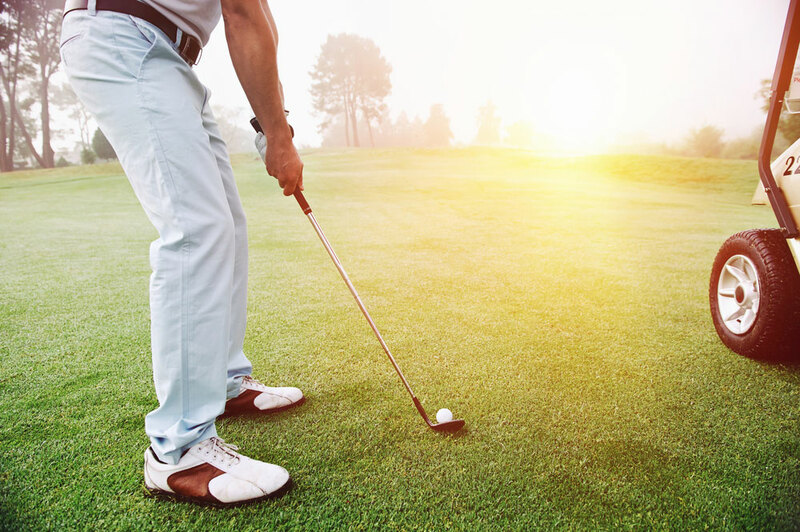 Part of your pre-shot routine should include picking a target, mentally sighting a line from the ball to the target, and lining up your shot to move at your intended target. Hitting straight iron shots begins in your pre-shot routine. Most beginners try to help the ball in the air by scooping or trying to lift the ball with the club. Ironically, this tends to lead to thin shots where the club strikes the ball in the middle and results in lower trajectory shots. To get your irons higher into the air, hit the ball on the downswing and take a divot after the ball. The descending blow will increase your chances to make good contact, compressing the ball, and causing it to rebound off the club face much like a rubber ball after hitting the ground. This compression and rebound also impart back-spin to the ball, stabilizing its flight, and providing stopping power around the green. Your shots have a rhythm to them that is dictated by the natural movement of your body. This rhythm is sometimes referred to as the kinematic sequence and dictates in what order different parts of your body fire for optimum clubhead speed and control. Swinging faster than normal forces parts of your body to move out of rhythm or sequence and results in skulled shots or shanks. Instead of swinging for full power on every shot, try to swing comfortably at 75% to maintain a smooth rhythm to your swing. During play, focus on this rhythm rather than the mechanics of your swing to keep a steady, consistent, and repeatable swing. If you are serious about improving your iron shots and your overall game, the gold standard is to use a camera to capture your swing in complete detail. Contact Live View Golf today to learn more about using cameras to help improve your swing.